28/09/2011 - With two rounds still to run, the 46th edition of the tricolored championship is heading to Mugello for its finale. This coming weekend the Tuscan track will be housing the seventh and penultimate round of the season, an appointment crucial for the title fight that involves seven drivers on top of the standings all within just 32 points. The prestigious ACI-CSAI championship with engines by Fiat Powertrain Racing sees Sergio Campana (BVM-Target) on top and quite busy in keeping the rivals at bay in a series showing a solid performance equilibrium. The closeset to the driver from Modena is Campana's team mate, the French Brandon Maisano who, thanks to the victory race two of the latest round, following Campana's race one win, closed a bit the gap to -14 points from the leader reaching for the first time the second position in the championship as well as the lead in the rookies classification. 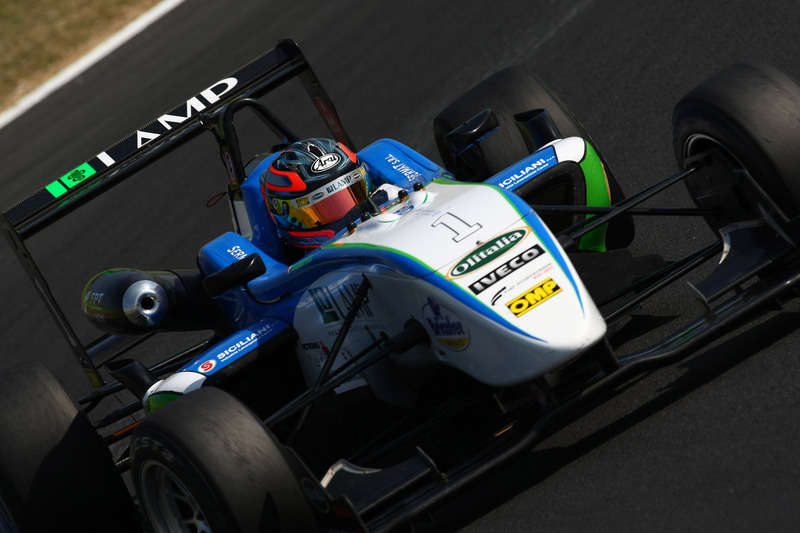 Among the rookies are the most dangerous rivals in the title fight such as Raffaele Marciello (Prema Powerteam), author of an impressive pole position in Vallelunga and second in race one after giving the position away to Campana in a much debated start. The 16 years old Swiss with Italian origins is followed by the French Maxime Jousse (BVM-Target) that left the latest round with a retirement in race one and a fifth place in race two and the Californian Michael Lewis (Prema Powerteam), back on the podium in race one. In sixth and seventh follow two more experienced drivers like Edoardo Liberati (Team Ghinzani), who had to content himself with a fifth and fourth place in the home race, and Kevin Giovesi (Lucidi Motors), fourth in race one and ninth in race two and standing now at -32 from the top of the classification. This gap still mathematically fillable in just one round and the fact that eight drivers won a race out of the twelve held so far, with four drivers swapping on top of the classification keep all possibilities open. Moreover, the collective test held last week at Mugello launches to the top of charts some new protagonists too. In fact, the day's charts were topped by the Argentine Facu Regalia (Team Ghinzani), that repeated what shown in Adria, while the Lucidi Motors couple was very close as the Brazilian Victor Guerin was just seven thousands slower and the Roman Eddie Cheever was nine thousands behind the leader. The top five spanned less than a tenth as Marciello was fourth at +78 thousands ahead of Giovesi at +95. Hopeful for the Tuscan round will also be Andrea Roda (Prema Powerteam), Federico Vecchi (LineRace-CO2 Motorsport) and Simone Iaquinta (JD Motorsport), with the latter not very lucky in Vallelunga. Edoardo Bacci will make his debut in Formula 3 as the protagonist of the latest two seasons in Formula Azzurra and Formula AciCsai Abarth will join the group on the number 31 Dallara lined up by LineRace - CO2 Motorsport. The 18 years old driver from Florence will make his debut in the series on the very same track where he obtained his only victory in Formula Azzurra in 2009 at the end of a good recovery started from the eighth position on the grid. The weekend will begin tomorrow with free practice scheduled at 9.30 and 14.55 (local time, GMT+2), while qualifying are scheduled for Saturday (10.25) and race 1 (16.05). Race two will be on Sunday at 10.10.